Vice-President Yemi Osinbajo’s media aide, Laolu Akande has disclosed that, Vice President Osinbajo this morning at one of the parishes of The Redeemed Christian Church of God, City of Grace Parish in Lokoja, testified to the goodness of God for saving yesterday during an unexpected crash. 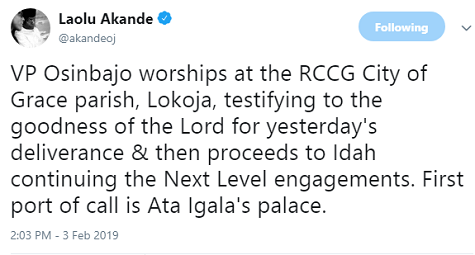 Akande disclosed this on twitter, tweeting; VP Osinbajo worships at the RCCG City of Grace parish, Lokoja, testifying to the goodness of the Lord for yesterday's deliverance & then proceeds to Idah continuing the Next Level engagements. First port of call is Ata Igala's palace.